The opening reception was Saturday, March 15, 2014 t CS Gallery, located at 66 Parsons Avenue, Columbus, Ohio. 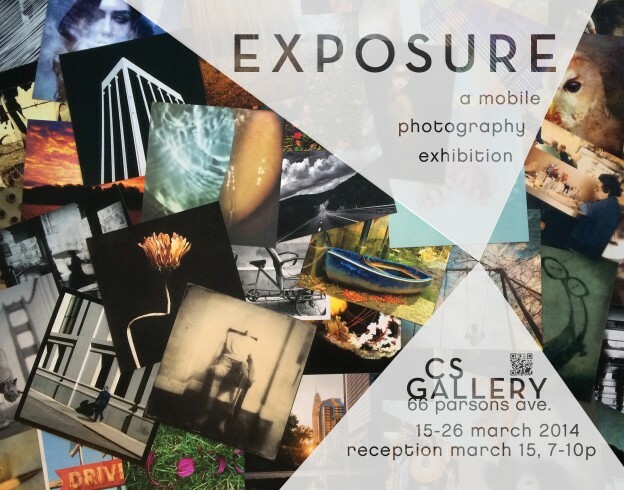 To celebrate the return of EXPOSURE, we re-created the ambiance of the power outage that occured opening night of the 2013 EXPOSURE exhibit — patrons were left in the dark to (fittingly) view the mobile images by the light of their smartphones. The atmosphere was special and intimate, and a disappointed “awwww” came from the crowd when power was restored. We thought it’d be fun to have a voluntary outage this year — the “Blackout Hour”. And WOW – WOW – WOW!!!! Exposure 2014 was record breaking! If you missed it you missed an amazing time! A huge thank you to everyone who came out and helped make this another great show. BUT it is up for two more weeks!! Come see it it will rock your socks! AND the online gallery is now open!! All works in the show are available in a limited edition of 5 prints!! Don’t miss out!! Great job – Amy, Cynthia, Jocelyn, Rocky, All the participating artists, a spcial thanks to Jeff, DJ MOXY, and Chuck for providing the music, and a special bit of food from Caroline and her man! Also thanks to all the local businesses that provided prizes for the raffle. Corner Stone, Abnormal Allies, Tavern Olde Towne, UpperCup Coffee, Voda, Old Familiar Barber Shop, and Cap City Tatoo.